A Monthly Journal Devoted to Brotherhood, Religion, Occultism and the Arts [1925-1928]. London, England. Publisher: Theosophical Publishing Society; Theosophical Society in England. Editor: Annie Besant, G.R.S. Mead; S.L. Bensusan (1925-1927). 1/1, September 1897-February 1909; 1925-1928. $2.75 a year. 96 pp. (varies). The journal was begun by Besant and Mead as a successor to H.P. Blavatsky's Lucifer, and it was then revived in January 1925, lasting until March 1928, with new volume numbering. An "American Edition" of the journal in its first incarnation was put out by the Theosophical Book Concern in Chicago. This is the most important journal for understanding the transformations of the Theosophical Society during the period, especially in England, under the leadership of Besant. Contributions by Besant, Mead, A.P. Sinnett, Francesca Arundale, Bertram Keightley, C.W. Leadbeater, Victor B. Neuberg, Ethel Rolt Wheeler, et al. After the revival of the journal in 1925 it featured Bensusan, George Arundale, Christmas Humphreys, C. Jinarajadasa, Mary Bligh Bond, Fritz Kunz, Clara M. Codd, and others. Indexed at austheos.org.au. The O.E. Library Critic in 1927 accused Bensusan of being "a Theosophical ostrich" for refusing to publish in the journal's pages rejoinders to his defense of the edition of The Secret Doctrine prepared by Annie Besant and G.R.S. 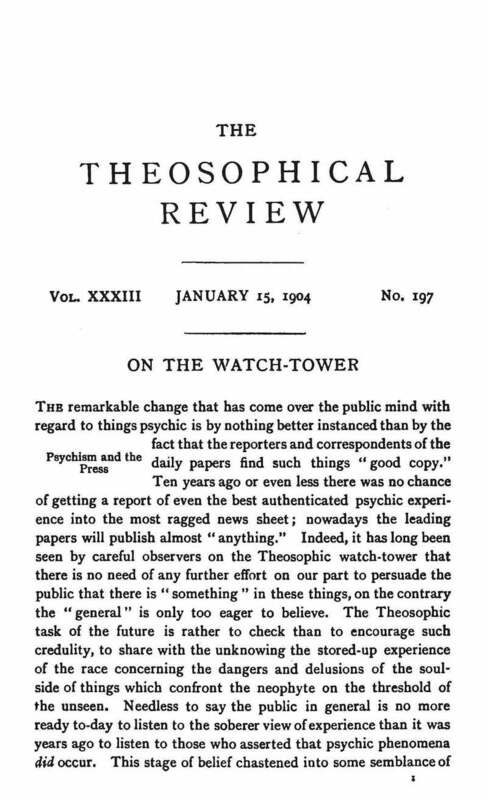 Mead, and the same journal in July 1928 noted "the now defunct Thosophical Review." BL; University of Pennsylvania Library; University of Massachusetts, Amherst; University of Pittsburgh; Deutsche Nationalbibliothek; NYPL.